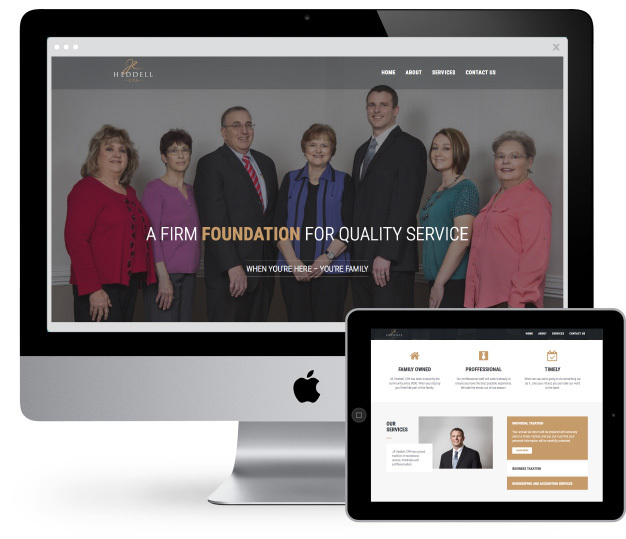 JR Heddell, CPA is a full-service accounting firm with a strong family foundation. Founded by John R. Heddell in 1984, the firm is now owned by James R. Heddell (Jay), John’s youngest son and the only one to follow in John’s footsteps to become a CPA. As a firm, both professionals and their staff understand the challenges that face small businesses and provide the bookkeeping and accounting support needed so that business owners can focus on the core functions of the business. JR Heddell handles any level of accounting assistance, from weekly payroll to comprehensive accounting services. As a fundamentalist, John ran the business on relationships made through face-to-face interactions and handshakes. While much of that core is still a large part of the business, Jay saw opportunities to bring new technology options to the business. By integrating a few key upgrades and looking at the marketing opportunities, Jay understood the potential to bring the firm up-to-date and expand its footprint. Jay Heddell turned to SJC Marketing for an exploration of the possibilities in terms of branding, market positioning and digital marketing trends. Through brainstorming potential options, Jay and the SJC Marketing team developed a plan for moving forward. The resulting strategic marketing plan not only paid homage to the tradition built by John, but also embraced the thought process of the younger generation to create a healthy mix that would appeal to the right audience blend. It was important to Jay to preserve the name of the accounting firm, while also demonstrating that a new generation would be taking the lead. As John would stay on for a few years to help facilitate the transition, Jay wanted John to be proud of any changes he put in place. Therefore, the resulting brand created for the firm centered on the initials of both the patriarch and his son, demonstrating the power of the name and the importance of preserving what was originally built. From there, Jay also wanted to create an online presence, something that had not been a priority in the past. In the website build, SJC Marketing sought to capture the look and feel of the new brand, while also demonstrating the value of the blended office. As Jay is taking the lead, it’s still important to communicate to the target market that the experience of the founder is still in place. Such positioning not only works well for long-time clients, but also those considering the firm over a competitor. The upgrade to the branding had an immediate impact on the JR Heddell CPA audience. Clients immediately responded to the modern look and feel, while also embracing the opportunity to work with a younger Heddell. With demonstrated experience and a personality that matches closely to his father’s, Jay has won over much of the client base, while working to bring in new accounts on a regular basis.